Last August 2012 and January 2013 (see here), we have provided an update regarding the status of Kaybiang Tunnel. This article is the final update of the tunnel that serves as the gateway to the once hard to reach areas of the western coves of Southwest Luzon which is home to serene beaches and magnificent sunsets. Before the construction of this tunnel, if you wish to reach the far reaches of Maragondon, Cavite and Nasugbu, Batangas coming from Manila; you have to go all the way south to Tagaytay City via the Tagaytay-Nasugbu Highway and turn back north to Nasugbu Batangas and to the unpaved and sandy roads of Patungan cove. The reason behind that is because the Palay-Palay mountain range to which Mt. Pico De Loro and Mt. Marami is part of, guards the majority of the plain flat lands of Cavite from impending storms and southeast monsoon thus blocking the access to the other side of Maragondon, Cavite. After a construction that took almost 4 years to complete, last July 1, 2013, the Philippine's longest tunnel as of yet was opened. Piercing a hole at the northern portion of Mt. Pico De Loro, Maragondon's Patungan Cove and Nasugbu can now be accessed coming from Manila through this tunnel without going around Tagaytay City. From 4 hours of travel to Nasugbu, via this tunnel, it can now be accessed for only almost 2 hours. Kaybiang Tunnel's vertical clearance is 4.85 meters and is about 300 meters in length and has completed the Ternate Nasugbu Highway loop for Southwest Luzon. The major difference aside from its completion last July 1 is that the Patungan Cove is now privately owned and is being developed by a businessman named "Virata". Thus the once residents of this beautiful beach has been relocated elsewhere and the road to Barangay Sta. 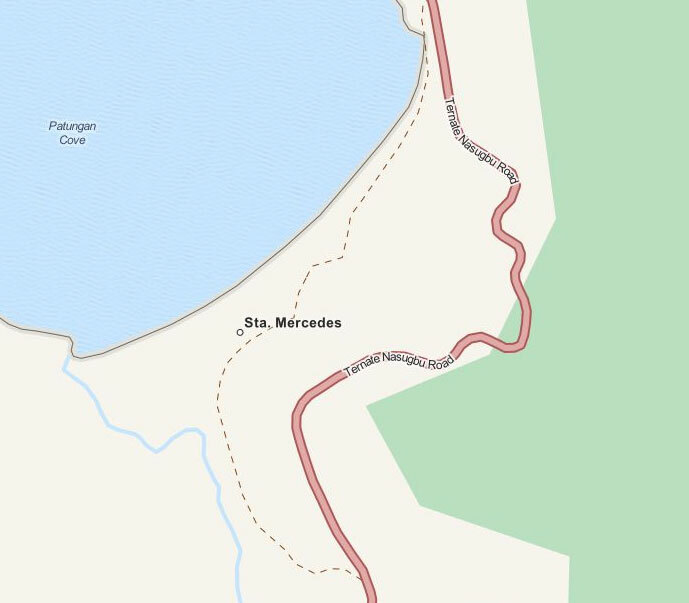 Mercedes to where Patungan Cove is now a private road. Thus, the Ternate-Nasugbu highway loop has been moved further off the shore of Patungan. To which the new road extends from Kilometer 98 to 100 of the Ternate-Nasugbu Highway. The previous loop to Patungan Cove. The following are the scenery that can be seen from a different angle in retrospect from the usual view from Ternate, Cavite but now from the other side of the Palay-Palay Mountain Range. Tabe Bridge, serves as the Cavite-Batangas border from Luzon's southwest side. was contructed, the road ends here. The road to the Ternate-Nasugbu Tunnel all the way to Papaya, Nasugbu, Batangas has been mapped and contributed to the +OpenStreetMap Philippines project for the use of drivers using their GPS Navigation System who plans to drive along this newly constructed road and tunnel. Hello. We're planning to have road trip this Holy Week passing through Kaybiang Tunnel to Patungan Cove coming from Molino. Just wannna know if its safe to pass through the tunnel and how much time it will consume passing through it? Are there also rough roads that we would be encountering? Thanks and God bless! all roads are already paved. the tunnel is only 300 meters and not much traffic. you'd be able to get through it in less than 30 seconds. enjoy your trip! can we walk trough the tunnel going to the otherside? You cannot easily walk in the tunnel ,too much dangerous for those who have an asthma. Its lack of air inside because it is too long. We are planning Company outing to Patungan,can we pass the tunnel through Bus?